During this time of major evolutionary alignment, we are looking for ways in which to become “light” to become enlightened. The many shifts and upgrades from the new planetary openings that have been upon us recently are forcing us to take responsibility for everything that we have created, from our very first beginnings eons ago. Our cells carry all memory from our first birthing from Source/God/Goddess. Each lifetime where trauma or pain occurs, the soul can splinter parts of itself and these splintered aspects need to be returned to the Soul Essence. As we clear the patterns that relate to the times of trauma or pain e.g. Broken heartedness, Verbal or Sexual Abuse, Poverty, Destitution, Abandonment or Fear. We gather those splintered aspects of ourselves and become more whole. There are many new modalities here to choose from which assist us to clear patterns, thereby creating change at a cellular level and personal level. It is crucial during these times, for those of us who are known as “light workers’ to fully take responsibility for our personal work and clear and let go of the habitually learnt and conditioned patterns which still present conflict for us. Every belief we have constructed about ourselves is a conditioned pattern. The patterns we have learnt from childhood and from societies values or previous lifetimes or parallel existences, are the sum total of residual trauma. This reside remains within our cells and our DNA. These patterns overlap and intertwine and through conscious awareness we can dissolve the triggers that are remain active. These triggers create buttons that push us to act with imbalanced emotional responses. These responses keep us from becoming consciously loving humans. Through conscious choice and new assessment, our awareness changes and we start to see and become aware of the patterns that continue to trigger an imbalance in our lives. We then have the choice to see them in a different light and change them. Many of us are trained to think as victims. I could even be daring and say that all of us are trained victims. Everything outside of ourselves is the problem, even to catching a cold or flue or allergies and we believe that conditions have created our situations, rather than to look to the reasons why we have attracted the condition and what it teaches us. We are being called to stand fully in our own empowerment. To take a giant step of courage and leave victim hood behind. Step away from being a victim of our environment, our training or societies beliefs and values. We are being asked to crack open and peel the beliefs and conditioning from ourselves. Let’s allow ourselves to become closer to our “light essences”. By taking this step of courage, we choose the understanding of personal responsibility, and by doing this; we gain self-awareness, self-empowerment and profound change. 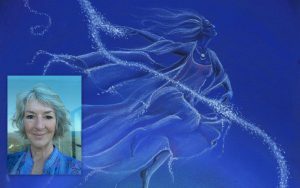 My new course Soul Line Clearing Course is a gift to the planet from the Divine Mother, the Universal Mother Goddess. She has guided me to create a profound process and through this process she gifts us with her unconditional Love and Grace. Grace is the clearing of Karma that would previously take many lifetimes to work through. The Universal Mother’s love assists us to dissolve the patterns we choose to change. In this profound work, we connect with our Soul Essence and the Divine Mother. We gain new insights and with the new understanding “bring into the light” and therefore initiate change. The outcome is Peace and a letting go of the Ego parts of ourselves that no longer serve us. We can more easily stop & do nothing in the face of conflict, for we now have the chance to let go of the attachments of Ego wounding and trauma.